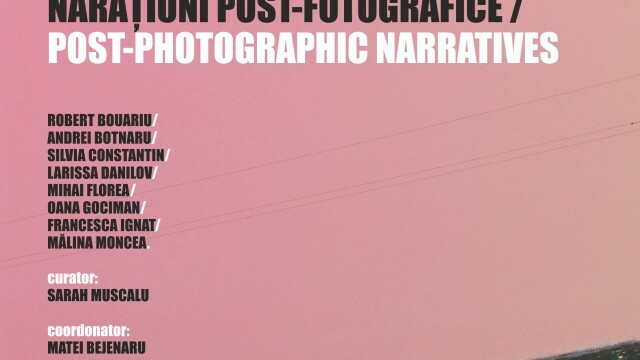 On Thursday, April 18th, 2019, starting 6 p.m., WASP Working Art Space and Production (67-93 Ion Minulescu Street, Bucharest) will host the opening of Post-photographic Narratives, an exhibition produced by the Photo-Video students from “George Enescu” National University of the Arts in Iasi, coordinated by Matei Bejenaru, curated by Sarah Muscalu. This project functions as a series of dialogues between the past, present and future built through the post-photographic language, common for the artistic practices exhibited. The visual solutions developed by these young artists propose specific contexts in which references to the past are working with subjects as memory and its reconstruction, the present is represented by the interactive dimension of the installations works which encourages unique, authentic and individual experience, leaving the references to the future narratives to be supported by digitally processed photos and three-dimensional printed objects that become vectors of rematerialization. The exhibition ensemble is built on the active principles of memorizing, documenting and interpreting reality, each of the eight participating artists assuming their detachment of the real, redefining the notion of photographic truth. The plurality of the proposed discourses strengthens the syncretic character of the practices by which questioning of materiality becomes the result of the recycling of information in its various forms. The exhibition can be visited until 25th April 2019 by appointment at coordination@4culture.ro / +40728083295. FOVEA is the rewriting of a body swept through by holes, by glimmers, by moments of incoherence. It is a project develloped from the desire of Karine Ponties of working with Ares d’Angelo in great detail, which fascinates and contradicts her. A being’s identity is the struggle between two hemispheres that send opposite instructions, and in him this is pushed to the extreme. In his body electric impulses trigger muscle contractions and develop into an augmented force in a state close to unconsciousness. 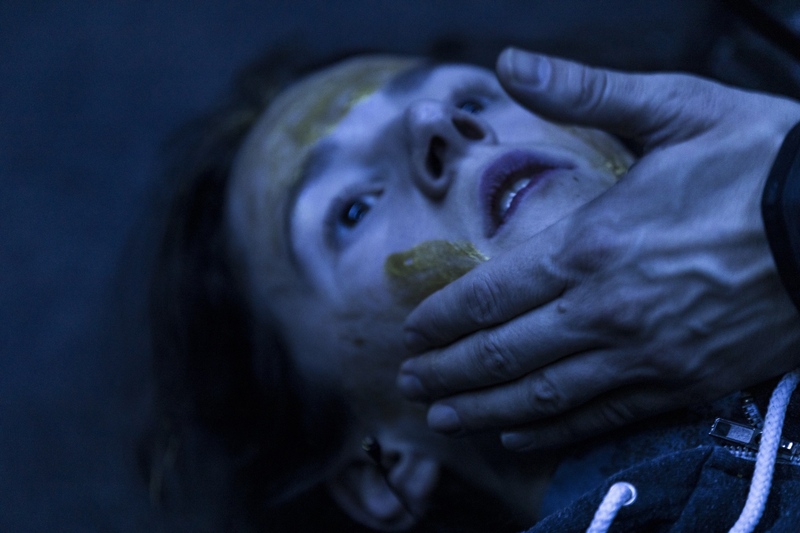 The performance was presented for the first time in March 2019 at the National Theatre in Brussels, in the frame of XS Festival. On the 15th of April the piece will be presented also in Timisoara at the opening of Cafékultour festival. Karine Ponties is the artistic director of Cie Dame de Pic, choreographer and performer. Along it’s twenty years of activity she created over forty dance pieces. Her work is characterised by a flair for the absurd, exploring intimacy and interlacing relationships. 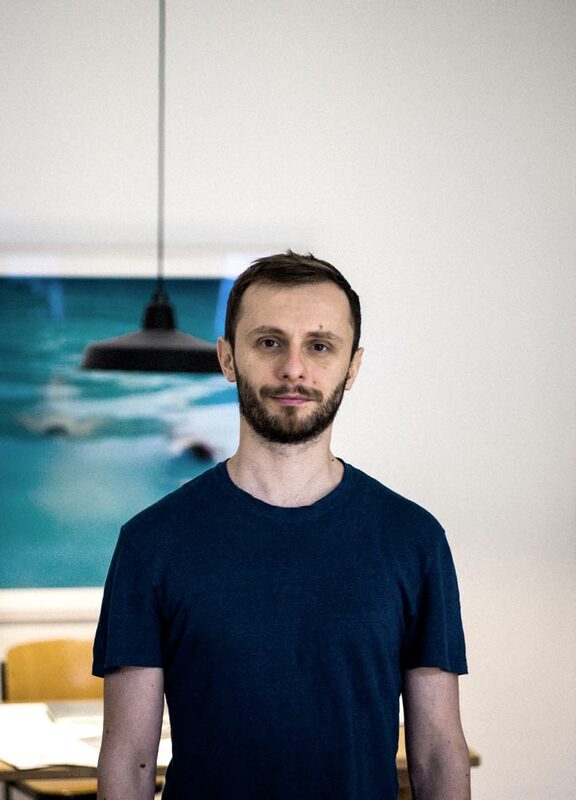 The International Choreographic Institute – ICI CNN in Montpellier will offer an artistic residency between 4th and 15th of March 2019 for a new production of Sergiu Matis (RO/DE), dancer and choreographer and for Mila Pavićević (CR/DE), writer. 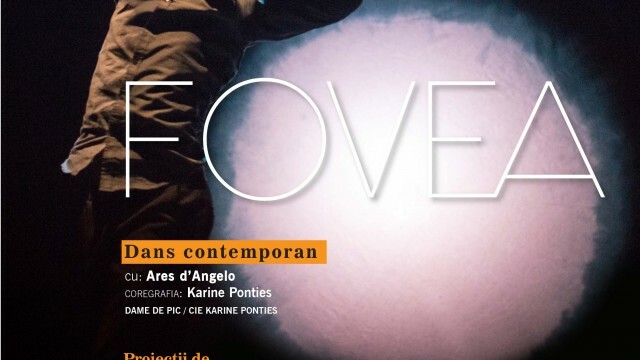 4Culture and ICI CCN Montpellier developed a project on dance and architecture in the frame of The 2019 France – Romania Season, offering residencies to Romanian and French artists. “In an attempt to understand and subvert populist aesthetics, folk dance elements have recently entered my work. As traditional culture is too often instrumentalized by identitarian politics, I have started re-dancing the folklore that I learnt in school, not only as an exercise in autoethnography, but also to put it in the context of my performance practice, which is informed by leftist, feminist and queer theory. Thus the question of identity has reappeared in my performance making. Through this I have found myself constantly reminded that I’m Romanian. Until recently I thought I was beyond that sort of identification, one based on nationality. I thought I was European, or even further: a citizen of the world. I had always wanted to be part of the core culture – and I did arrive in it, but from the periphery. The artistic residency is sustained by the DanceHub activity, in the frame of the European cooperation project Life Long Burning, sustained by European Union, Creative Europe Programme 2018 -2022. 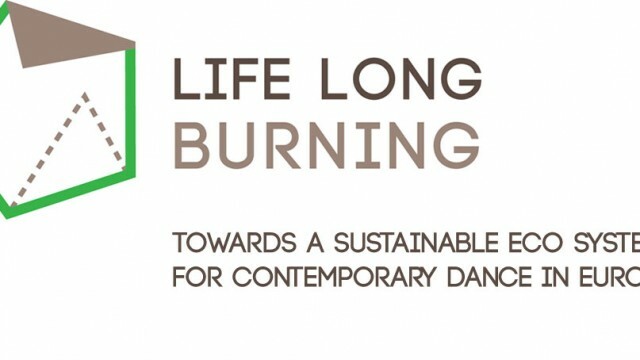 Life Long Burning - Towards A Sustainable Eco-System for Contemporary Dance sustains the contemporary dance and performance scene in Europe. The multiannual programme is coordinated and implemented by a network of 11 European organizations, associations, companies and production houses: 4Culture (RO), CCN Montpellier (FR), Cullberg Ballet (SE), danceWEB (AT), Het Veem Theater (NL), Lokomotiva (MK), Station (RS), Tala Dance Center (HR), Uferstudios (DE), Ultima Vez (BE), Workshop Foundation (HU) and workspacebrussels (BE). 4Culture’s activies in Life Long Burning Project in 2019 are co-funded by the National Cultural Fund Administration (AFCN). The project does not necessarily represent the position of the National Cultural Fund Administration. AFCN is not responsible for the content of the project or the way the project results can be used. This is entirely the responsibility of the beneficiary of the funding. P.A.R.T.S. is looking for a new generation of talented dancers! On March 30, WASP Working Art Space and Productions will host P.A.R.T.S. Audition pre-selection for the new training programme 2019 – 2022, dedicated to all interested young artists, between 18 and 23 years old who want to start a professional education to be a dancer or choreographer. Registration fee is 10 €. 2) Only candidates who have passed the pre-selection will receive an official invitation with a detailed explanation of the final audition. The final audition process takes place in Brussels between April 9 until April 14.The entire full-week participation in this final stage of the audition is necessary to be selected for the Training, so block the dates now! ➝ Candidates must have a secondary school diploma before the 1st of September 2019. ➝ The minimum age of entry for P.A.R.T.S. is 18, the maximum age is 23 (both ages on December 31 2019). ➝ Students at P.A.R.T.S. need to have a good level in English (B2 or higher in CEFT scales). This is essential for being an active participant in the programme. ➝ To participate in the preselection, you will have to pay the obligatory sum of €10 at the online registration. The study programme is available here: http://parts.be/training-cycle. ➝ Candidates are encouraged to apply for grants awarded by their local (municipal, regional, national) authorities or private foundations. ➝ P.A.R.T.S. can provide some scholarships to those students who do not have enough financial resources and have not succeeded in getting scholarships from other funding bodies. P.A.R.T.S. depends on external sources for scholarships, so nothing can be guaranteed. P.A.R.T.S. will only give scholarships to students who can prove they have undertaken serious attempts to obtain a scholarship elsewhere. ➝ The preselection will take a whole day; the doors will open at 09.00 am, the first class starts at 10.00 am. The results will be announced by the end of the day. ➝ Candidates should bring an ID (identity card or passport). P.A.R.T.S. is an international school for contemporary dance, which offers a full-time training cycle to young dancers and choreographers. The school was founded in 1995 by Rosas and De Munt/La Monnaie and is directed by choreographer Anne Teresa De Keersmaeker. P.A.R.T.S. offers a full education programme in the field of contemporary dance and consists in a Research cycle and in a Training cycle. Image by Tine Declerck — with Tine Declerck. On Monday, 4th of March, starting 19:30, at the Byzantine Hall, at the Romanian Embassy in Paris, Wanda Mihuleac coordinates a multidisciplinary event, presented by Transignum Editions in the frame of the national french festival “Printemps de poètes” 2019. 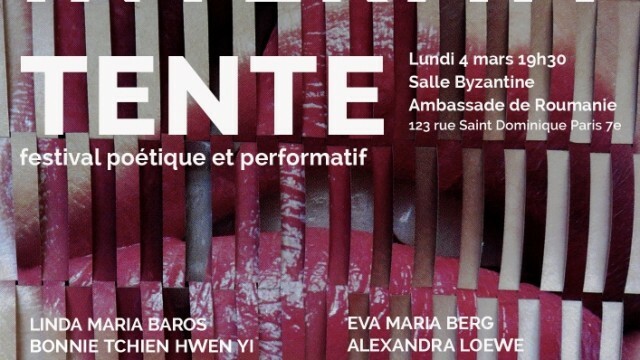 La Beauté intermittente is a poetique and performative festival, organized in the frame of The 2019 France – Romania Season, in which poetry, plastique art, music and performances are presented by the artists in a non-conventional manner, reflecting on the Europe’s multicultural image. “Printemps de poètes” is a prestigious cultural platform in France, being considered also a “A cultural center for poetry resources”. The participation of the romanian artists, Linda Maria Baros, Doina Ioanid, Simona Popescu and Andreea Capitanescu, highlights the value of the Romanian feminine poetics, and also of the artistic representation in this large festival. Linda Maria Baros, whose poem will be featured by Swiss composer Jean-Luc Darbellay, in the interpretation of the trio led by Marc Sieffert and performed by Taiwanese Bonni Tchie Hy, with the portable objects of Tia Calli Borlase. Doina Ioanid - poetic performance with Valentine Mizzi and saxophonist Philippe di Betta. 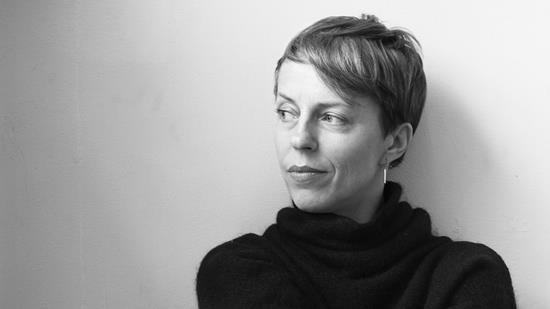 Eva Maria Berg - German poet translated into French and Romanian will be associated with the music created for this poem by composer Violeta Dinescu, performed by Marc Sieffert trio, performance by Alexandra Loewe. Simona Popescu and Andreea Capitanescu will present for the first time a poetic video performance and choreography. Text and video performance realized by Andreea Capitanescu, Simona Popescu and Malina Moncea. The event is organized with the support of the Romanian Cultural Institute. WASP Studios launches the first open call of this year and has the pleasure to invite Romanian professional female artists to participate to the workshop coordinated by the choreographer Eszter Salamon. The workshop will take place between 11 and 16th of February 2019, from 10 am to 3 pm at WASP Working Art Space and it is dedicated to the professional female artists in the contemporary or classical dance field, with good physical technique, experience in using their voices or open to work on voice. Four artists, will be selected after the workshop to participate on the last performance produced by Eszter Salamon – MONUMENT 0.8: Manifestations. The production will be developed during 2019 with rehearsals in Bucharest and Brussels, followed by world premiere in Brussels and an international tour. Manifestations is a dance and choral performance built on the “embodiment” of documentary images and sound, as a concept and as a practice. Enlisting the collaboration of historians of Feminist History as well as four female performers, the work aims to reactivate gestures that could be witnessed as part of public demonstrations in the context of historic women’s movements. Technologies for embodying movement will be developed in collaboration with the artists. The vocal score and techniques of modulating sound will be developed with the help a vocal/singing coach. An opportunity for different ages of professional women artists in the field of contemporary and classical dance, open for body and vocal experiments, available to participate for a new international production. For subscriptions please send a biography and a work portfolio, in English and Romanian to contact@waspmagazine.com, until 6th of February 2019. The confirmation for participation will be sent until 8th of February. The workshop has free admission. Eszter Salamon is a choreographer, dancer and performer who lives and works in Berlin. Since 2001, she has been creating solo and group works that have been presented in performing arts venues and festivals throughout the world including Centre Pompidou, Avignon Festival, Ruhrtriennale, The Kitchen New York, HAU Berlin, Berlin Documentary Forum, Kunstenfestivaldesarts Brussels, Kaaitheater Brussels, Festival dʼAutomne Paris, Tanzquartier Wien, Holland Festival, Kampnagel Hamburg, steirischer herbst graz, Dance Triennale Tokyo a.o. She is frequently invited to present her work in museums, including MoMa, Witte de With, and Fondation Cartier. The workshop is organized in the frame on Manifestation project, produced by WASP Studios and 4Culture Association. 4Culture, co-organizer in the European Life Long Burning project, offers a full danceWEB Scholarship to a Romanian artist in the field of contemporary dance and performance. The danceWEB Scholarship Programme is taking place from 10 July to 14 August 2019 in the frame of ImPulsTanz – Vienna International Dance Festival. Deadline for applications is 22.02.2019. + filled in application pdf form (please fill it in with adobe reader version 8 or higher and respect the character limitations in the boxes)All documents need to be in English! The mentors of the danceWEB Scholarship Programme 2019 are Anne Juren & Annie Dorsen in dialogue with Mette Ingvartsen. The danceWEB program offers young professional dancers and choreographers from mainly European but also non-European countries the possibility to take part in an intense multinational further training program. The program focuses on the exchange of ideas and knowledge, not limited by national borders, on concentrated further training, on meeting with internationally renowned artists gathering at ImPulsTanz with the aim to orient the career of the participants. Life Long Burning (LLB) – Towards a sustainable Eco-System for Contemporary Dance in Europe is a multi-annual cooperation project supported by the EU Creative Europe Program for 4 years (1.07.2018 – 30.06.2022) and implemented by eleven organizations. 4Culture’s activies in Life Long Burning Project in 2019 are co-funded by the National Cultural Fund Administration (AFCN).The project does not necessarily represent the position of the National Cultural Fund Administration. AFCN is not responsible for the content of the project or the way the project results can be used. This is entirely the responsibility of the beneficiary of the funding. 4Culture Association, in partnership with WASP Studios, launches the first edition of Bucharest Arts and Public Space Festival, which will take place from 15th till 19th of December at WASP Working Art Space and Production and Galateca Gallery in Bucharest. „The increasing of the social dynamics, as a result of people’s mobility and the new urban contemporary communities, brings also a lack of knowledge about what our cities can offer, their history and potential for every citizen or tourist. During the first edition of Bucharest Arts and Public Space Festival, artists from Romania, Germany, USA and Belgium are invited to bring a contemporary view on urban space, starting with the cultural heritage – monuments, statues, parks, public gardens, through an artistic approach, including performances, installations and workshops”, declares Andreea Capitanescu, 4Culture artistic director.The festival will start on 15th and 16th of December at 19:00, with Duet-C Eliade, a participative performance in which the belgian artists Roel Heremans creates choreographic mental experiences using abstracts properties of the medium radio. He uses location-specific, architectural patterns to create temporary spaces in which sound stimulates thought processes and changes visual perception. Heremans examines how a system of collective thinking relates to the specific place in which that system is located. For Bucharest Art and Public Space, Roel delved into the late philosophical works of Mircea Eliade and developed an interactive imagining choreography that deals with Eliade’s idea of cyclical time. During the festival you will be able to experience his participatory-performative work for 2 up to 8 people at a time. In Body and architecture in the urban space, the video-sound installation signed by Maria Balabaș and Andreea Căpitănescu, the city is highlighted through the sonorous presence of the body-object, a critical observer of the events and passing time. Voices from the archive of the Romanian Broadcasting Corporation, published by Casa Radio is a performative sound installation, in which Maria Balabaș searched a narrative thread through texts and vocal timbres, for a common element – a phrase, a verse or a memory. The sound performance was born from all those meetings put together: Ana Blandiana, Eugen Ionesco, Nina Cassian, George Coșbuc, George Bacovia, Alexandru Phillipide, Henriete Yvonne Stahl, Ion Caraion, Maria Banuș, Mariana Marin, Șerban Foarță, Mihail Sadoveanu etc etc. 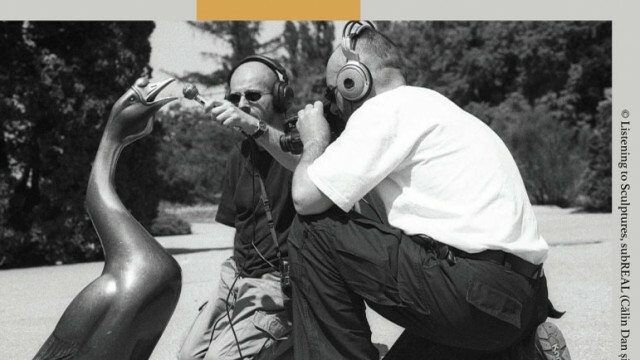 In a moment when we don’t know whom to consider a moral and artistic landmark, this incursion in the sonorous archive of the national radio, functions as well as a remembering process, identity reconstruction and inspiration. On Monday, 17th of December, at Galateca Gallery, Michael Douglas Kollectiv & Dana Caspersen invites participants to join a new kind of public interaction to examine the question: How do we as individuals impact the level of violence in the world? During The Exchange performance, participants move through a terrain of action that is brought to life by their motion and is shaped by their experience and beliefs. The performance utilize simple physical actions, such as walking, gesturing, and physical imagination as tools of exchange for engaging in this collective examination. The Romanian artist Sergiu Matiș, who lives and performs in Berlin, will present on 18th of December at WASP Working Art Space and Production, the solo performance Nocturne for broken vocal cords. Nocturne for broken vocal cords is part of Sergiu Matis’s Noise Nocturnes, a series of performances and texts that revisit the romantic genre in its fascination for the night and darkness, imitating nature of recycled texts spoken at high speed or shouted, constitute the dense score of the nocturne. Choreographic tools applied to movement and voice make navigation possible through the overload of glitches and fragmented moves and sounds, by supporting chaos with coherence. In Listening to Sculptures, the photo-video installation, presented on 19th of December starting 7:30 p.m., at WASP – Working Art Space and Production, Călin Dan and Iosif Király (subREAL) are acting like two reporters armed with microphones, headsets and a recording camera, who interrogates figurative public forum monuments. The performative dimension of the entire Interviewing the Cities project is exaggerated through this series, which poses in a critical light both the public forum sculpture, and the mass-media standing in the contemporary culture. At WASP, SubREAL will bring to attention the process of starting the project, presenting different work steps alongside with pieces that became iconic through years, but also some making off images, documenting photography of the photographic process. The project 2565 main [Relative Position], produced by 4Culture and WASP Studios is a collaboration between the visual artist Ciprian Ciuclea and the composer Cătălin Crețu, designed as a multimedial space with 3 combined video projections and the sound generated by a mathematical algorithm. The installation will be presented at WASP, on Wednesday, 19th of December, starting 7:30 p.m.
During the festival, there will be presented a series of multimedia installations produced by 4Culture Association and WASP Studios in 2018, and also a contemporary design workshop coordinated by Simana Filat, designer, recently awarded by the Union of Fine Artists in Romania. The workshop is dedicated to high-school students and will take place in the artist’s studio. Free access at all the festival’s events. ▪ Multimedia installations – 4Culture & WASP Studios productions***Event organized in the frame of „Bucharest Arts and Public Space”. A cultural project financed by the Municipality of Bucharest, through The Administration of Monuments and Touristic Heritage.